These days Dead Space fans seem scared by something other than the jumps and thrills of the series. It's what the next installment in their beloved horror series could turn into that terrifies them. 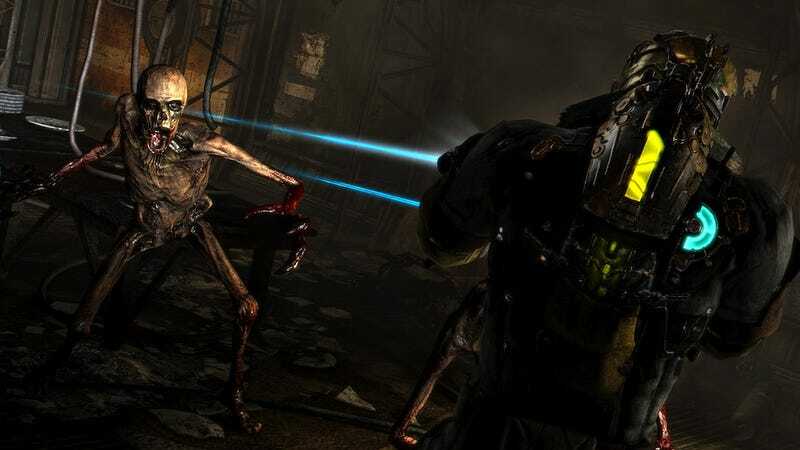 Visceral's horror franchise has won players' loyalty for a few key staples, like dark claustrophobic corridors, sudden scares and menacing Necromorph enemies. In the two Dead Space games released so far, great sound design and assured pacing—where big set pieces balance against sequences of quiet dread—have created memorable experiences for players. But fans of the franchise are nervously awaiting the release of Dead Space 3, a title in the series that seems to take some steps away from said familiarity. For one thing, there will be co-op for the first time. Cooperatively playing through Dead Space is for pansies, some fans say. It takes the thrill away from exploring the religious lore, ominous artifacts and hallucinations you experience as a lonely Isaac. And while I don't personally feel this takes away from the franchise, it's obvious to Visceral and EA that introducing a co-op mode has taken the title's fans outside their comfort zones. Dead Space Was Always A Co-Op Game. Visceral Just Didn&apos;t Know It Yet. So they want you to know: as much as this new title is making steps outside the bounds of the original Dead Space, it's still very much building on the same foundation of what made the first two games great. Where's the proof? I saw some encouraging signs in an optional Dead Space 3 side mission I checked out last week. Wait, optional side mission? We're talking full-on, non-linear, exploration-encompassing side missions. That doesn't sound very Dead Spacey. Even so, it's in this side mission that I found the game to resonate with its predecessors. Isaac is exploring the Lost Lunar Flotilla and, in response to an outgoing signal, boards one space ship that's been desolate for over 200 years. He'll find more information on the origin of the Necromorphs—a very clearly pressing matter if you've ever played even a moment of any Dead Space title—while aboard this research facility floating in space. It's here that I navigate Isaac up and down ladders, and around the bends of windy, dimly-lit corridors. The only difference in navigation is that now Isaac can roll, and take (non-sticky) cover. But Isaac doesn't just encounter the gangly Necromorphs he's encountered dozens of times previous. He'll also have to solve certain puzzles to be able to open doors or start generators. Sometimes, this includes using Kinesis to turn handles or remove doors. In between ships—as well as debris of ships floating around the Flotilla—Isaac will gracefully float in zero gravity to carry out his investigative exploration. (I'm told that certain paths will be specifically dedicated for the co-op experience, so it sounds like exploring with a friend has its benefits.) If you've played a Dead Space game, you might be taking in a breath of air from relief. These are all familiar aspects of the franchise. But while I was playing I couldn't help but think dreamily of the newer Dead Space developments. I thought back to the swirling snowstorm I first saw at E3 and how it could hide armed enemies (a new inclusion) that could strike at me from the blinding whiteness. That's a case of new elements creating a different kind of fear. Potentially not such a bad thing. I can see why there's some trepidation towards antagonists equipped to shoot back at you. Maybe you're thinking this is just going to be some other actiony shooter that you don't care for. Horror isn't mainstream, after all, so it figures they'd water it down with fast-paced action, right? Since my encounters with them have been hands-off, I can't speak to how it feels to have armed zombie-like enemies tracking you through the snow. But I'm optimistic. Visceral hasn't let me down with the series yet, and I don't expect them to start now. My time hands-on with the game was short. EA took me through a short sequence to show off some of the more claustrophobic environments that harken back to older Dead Space. Demos like the one I checked out at E3 seem to be a stretch for the franchise. Once you factor in the wide-expanse of a snowy planet and new, human-like enemies that can shoot guns at you, it's easy to wonder what happened to your Dead Space. Fortunately, if you were looking for it, this one particular level showed off the traditional feel that the game's representatives promise it won't forget about. But I'm not so concerned. I want to see more of what's different. I'm hopeful. I'm confident, even, that the developers have had enough experience with their own franchise to evolve it properly. It may very well turn out that a less linear experience and experimental enemies might not do the game any favors. Maybe co-op—which is 100% optional (your co-op bud won't appear as AI if you choose to experience the game in the traditional single player route)—won't be as terrifying. But I'm curious to see where the franchise goes next. Even if it isn't the Dead Space you remember and love, maybe Visceral can introduce you to another side of Dead Space that you never expected. It might even be great.